Yes, again. After you recycle all those boxes and sort through the madness, did you find yourself with a few new White Elephant gifts? Those are the obvious. Here is a new challenge: find a different perspective. Think of some new ways to pinpoint what doesn’t really need to be in each room of your house. Invite a toddler over and follow them around: what can they grab? Remember, buyers may have children with them when they tour your house. Take a few photos of each room. Do the photos look clean and appealing, or do you see more stuff in the way? 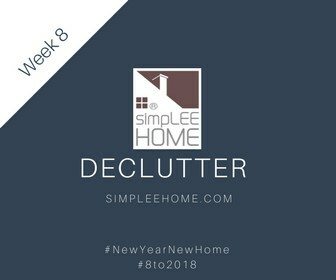 Now you are getting the declutter bug! Do you have rugs covering carpet (and what else do they cover, buyers will wonder…)? Are your bookcases and shelves jam packed? See the blog post linked here for suggestions on how to simplify the look and décor of your bookshelves. In fact, visit my board Staging Your Home for Sale. Invite a close friend to walk-through and tell you what they see that they don’t like. This must be a good friend to get the truth and since you are asking, you can’t hold a grudge! So, one last round through the house for the year-end: pack it up (this is pre-packing for moving day, less to do later! ), donate or throw it away. To review the entire series, start at the top with Week 1’s Tip and continue on to review all of our previous tips in this series. Have you found any of these particularly helpful? Feel free to comment below with your favorite tip to prep to sell your home! Happy New Year, and New Beginning! Show us some social love! Why is Buying a House so PAINFUL? Only real estate agents who are members of the National Association of REALTORS® may call themselves REALTORS®. All REALTORS® must subscribe to NAR's Code of Ethics and Standards of Practice, pledging honesty in all dealings and protection of the public.